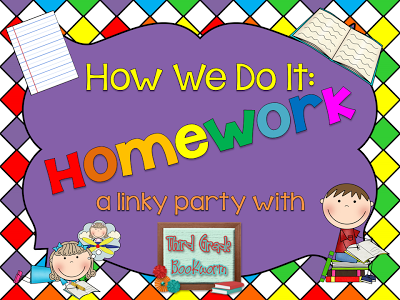 I'm joining Abby from Third Grade Bookwork for a Linky party about homework. I've had my battles with homework. Should I assign it? If so, how much? It has taken me four years, but I finally have a homework plan that works for my students, parents, and me! I use Daily Warm-Ups for Reading by Teacher Created Resources. 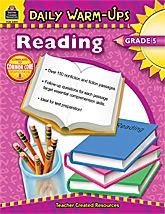 The book has a both fiction and nonfiction passages with three to four reading comprehension questions with each passage. They have the books in K-6th grade and have other subjects, besides reading. In order to tie in Common Core, I require students to find textual evidence to support their answer. The assignment takes students between fifteen and twenty minutes to complete. Finding textual evidence takes them the longest. At the beginning I had them underline the evidence, but some of my students were just randomly underlining sentences. Now I require students to write in complete sentences next to their multiple choice answer. I'm looking forward to reading about everyone else's homework ideas. See you at Third Grade Bookwork. I do use reading passages like the one you mentioned above. I love that you mentioned making sure the kiddos underline or explain how they know their answer is correct. If we practice things like that all year long in small doses, we don't have the "testing frenzy" when it comes time for our state assessments!